It’s Day 10 of our October Challenge. 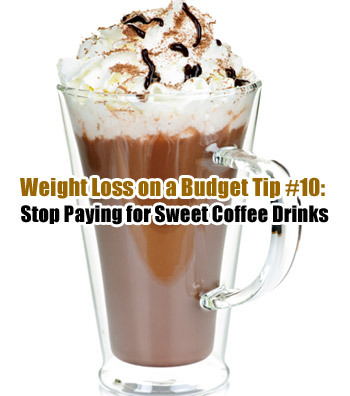 Here is your Weight Loss on a Budget Tip for the Day: #10 – Stop Paying for Sweet Coffee Drinks. You can save money and avoid excess calories by avoiding sweet coffee drinks. You know that ones I’m talking about…I won’t mention the brands. I’m talking lattes, mochas, and all the frosty sweet coffee concoctions you love. Pairing the rush of sugar with the rush of caffeine can be very delicious and addictive. I know it may be hard to kick the daily habit you may have developed for these drinks, but you can do it. So you are saying to yourself, “I need my caffeine!”. Ladies, you can still have coffee. You have to ask yourself whether you really need that $3-6 coffee drink vs. a low cost/free regular cup of coffee with milk (and/or with a sweetener…but you know how I feel about diet sweeteners). Making coffee at home or indulging in the free stuff at work will save you money in the long run. Just be careful and watch those extra calories. On average, half and half is 20 calories per tablespoon and regular sugar is 49 calories per tablespoon.